Spekta/Spekta 2 | SCREEN Graphic Solutions Co., Ltd.
Higher quality print with conventional printing equipment and methodsWith AM screening, the most widely used form of screening today, the position and angle of dots remains fixed, but the size of each dot is varied to reproduce the effect of continuous tone. On the other hand, FM screening (or stochastic screening) uses dots of the same size, but places them randomly in varying amounts to reproduce continuous tone. With the FM method, it is possible to produce very fine detailed print and eliminate the moiré and broken lines associated with AM screening. 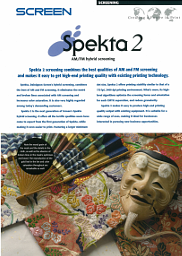 With SPEKTA screening, you can have the best of both AM and FM screening methods. And you can have it on every page and every image that you print. ​Makes high quality print more accessibleWith SPEKTA, the quality that can be achieved with an ordinary setup of 175 lpi and 2,400 dpi will appear equal to that of 300 lpi printing. And it can achieve this without the stringent controls usually required for high lpi printing. Higher quality print is achieved with the same printing equipment. Totally free of moiréThe placement of dots is always random with SPEKTA, as in FM screening, which means there are no screen angles to contend with. As a result, SPEKTA avoids the moiré resulting from interference patterns between screen angles and items such as lace cloth, stereo speaker mesh, and CRT screenshots. It also eliminates the rosette moiré that can occur in dark gray or black areas. Brings out life in the midtonesSPEKTA does a better job of bringing out the vibrancy in the midtones for skin colours and other areas where true-to-life colour is required. Photo images of fresh flowers and fruit, sumptuous meals and desserts it is easier than ever to reproduce the full appeal of these in print with SPEKTA.